What do you get? Let me show you. I did some projects today, and looked back on where my happy little roadster started. 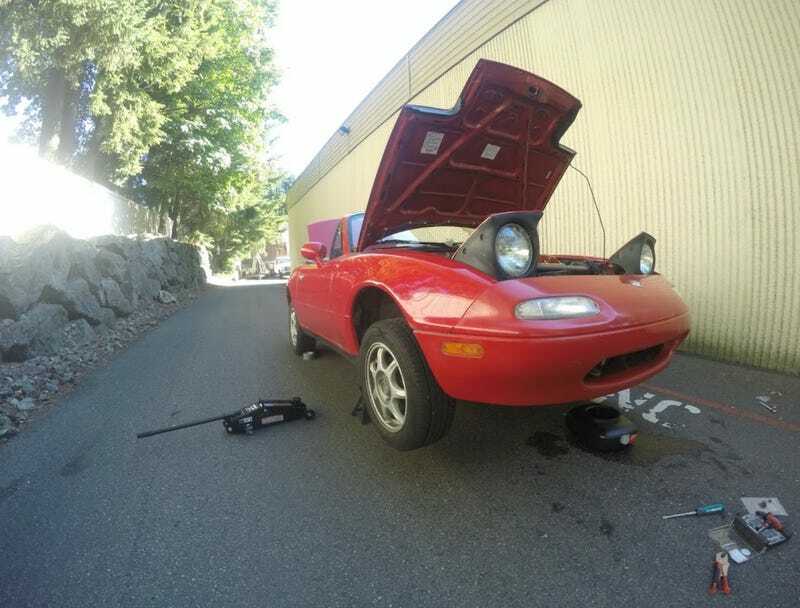 I don’t think I’ll ever be able to not have a Miata, guys. The header image is the first picture I have of my car. With the help of a friend, I swapped a radiator behind NAPA auto parts, which was my very first automotive job. And... It was easy! No problems, which is more than I can say about the last few projects. See that locking wrench in the bottom corner? I miss it. For the last two years it’s been holding a Cable to my battery terminal... I’ll get that fixed one of these days. The first big projects I tackled were new brakes all around, wheels, and tires. Made a pretty big difference look wise, and obviously a massive difference in how the car felt. Only problem was the lack of low looked very goofy with the larger wheels. Check out the picture below and tell me that looks normal. It would be over a year before I finally tackled that issue, and installed coilovers. Look at that wheel gap!! That’s stock. Crazy.... Oh and the not-alligned stickers on the window? Yeah. That was pretty bad. My rear lip spoiler tore off the bumper a few weeks ago. The holes were damaged, so I decided to try 20# tape. This much is probably overkill, but hey. Boom. Muuuuch better. It’s amazing how big of a difference these little lip spoilers make. But... They do get pretty beat. Peep the exhaust. 2.25 inch from the headers back. Perfect for an na car, although I’ll want something bigger if I go turbo. Low. Unfortunately, without an alignment I can’t utilize the extremely long shock travel without tearing my fenders up. So for now compression and rebound are set super stiff so I don’t do any more damage. Once I have it aligned, I should be able to use the full range of travel, which means I’ll finally be able to see why these have been considered the holy grail of Miata suspension for so many years. Cannot wait. What’s next oppo? Obviously power mods, and tires soon. But am I missing anything? I feel like everything is fairly well put together at this point, and no particular section is lacking in upgrades (besides power). Hardtop would be nice, as would a second set of wheels, but neither one would really improve the performance of the car in a meaningful way so.... Who knows.